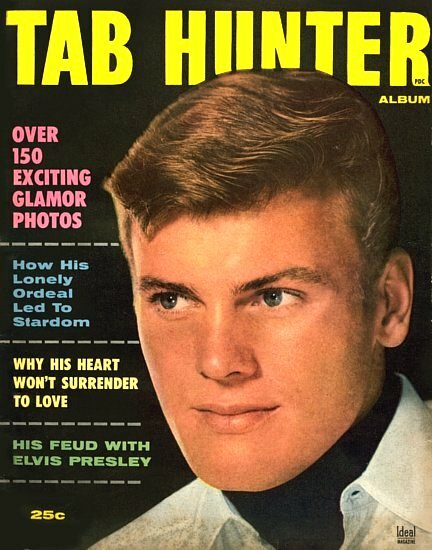 Tab Hunter died this past Sunday. He was just shy of 87. His age makes him part of what’s known as the “Silent Generation,” a cohort born approximately between 1928 and 1945, who were too young to have served in World War II and too old to be Baby Boomers. In the case of gay men and lesbians of this era, it might as well have been called the “Silenced Generation.” They came of age in what was perhaps the most repressive period for LGBTQ people in the history of the country. 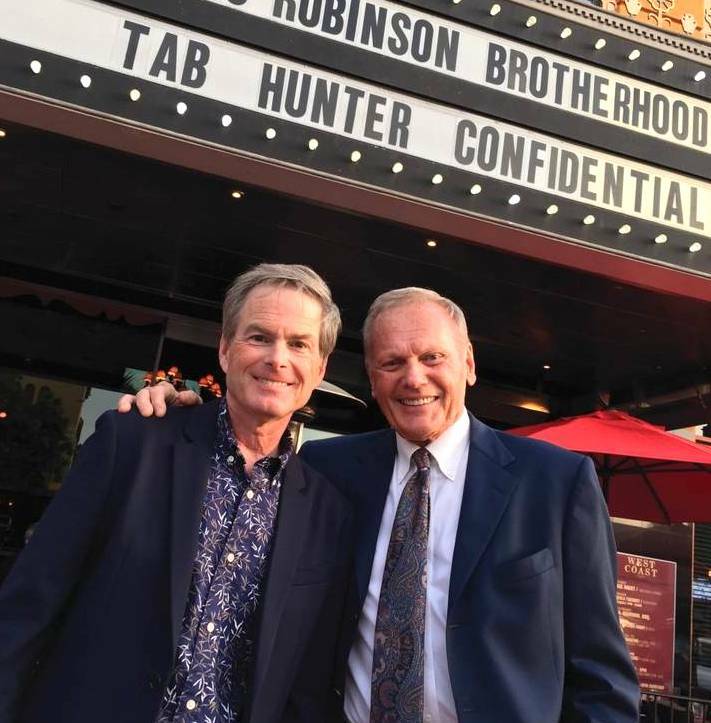 A 2005 autobiography and 2015 documentary, both titled Tab Hunter Confidential, (available on Netflix) tell the full story about Tab’s life and career as one of the biggest stars of the 1950s. His chiseled looks and boy-next-door smile made him one of the idols the 50s teenage culture explosion–and an object of desire for gay men during the beefcake era. The “Sigh Guy” at the height of his stardom. Tab’s first major role was in Island of Desire in 1952 with Linda Darnell. Just out of the Coast Guard and plucked from his job as a stable boy, Tab’s “talent” was not so much acting as looking hot while shirtless on a beach. (The production stills look like an Abercrombie & Fitch catalogue.) Eventually, Tab learned how to act and did reasonably well in Westerns and war movies. 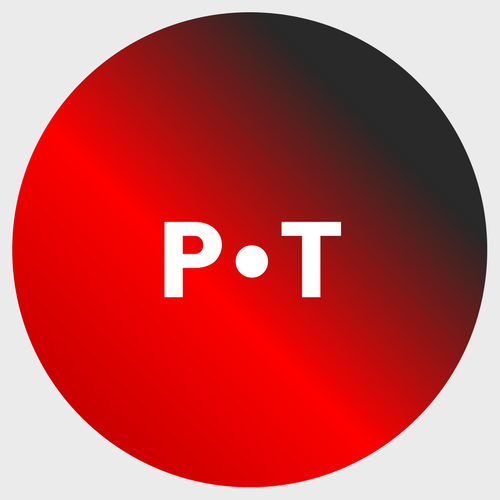 He was particularly good in some of the “Playhouse” live television dramas of the era that allowed him to play against type—as a soldier with a secret, or as a boy next door who was a psychopath. His biggest film role was as Joe Hardy in the 1958 film adaptation of Damn Yankees. Watching the documentary, it’s surprising for those of us who weren’t around in the 50s that Tab was a big recording star. In fact, he claims Warner Brothers records was created as a crossover vehicle for his songs. His star on the Hollywood Walk of Fame is for his singing career, not his acting career. He appeared on most of the big variety shows of the era singing songs like “Young Love,” which was a number one hit. He was a prototype for today’s multimedia teen idols, like the Jonas Brothers or Selena Gomez—selling teen magazines while his songs were playing on the radio and his movies were opening at the local cinema. 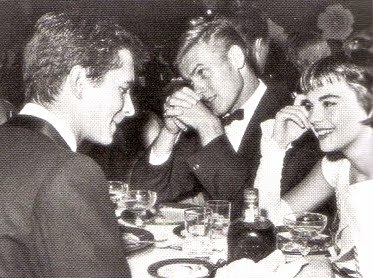 Tab with boyfriend Tony Perkins, and “girlfriend” Natalie Wood. Of course, the boy next door was also gay, having significant relationships with figure skater Ronnie Robertson and Anthony Perkins. All the while, there were studio-created romances for the both of them, with Natalie Wood often seen in public with Tab, and Shirley MacLaine with Perkins. The stress of living a double life must have been incredible, particularly when the notorious rag Confidential released police records from his arrest at a gay “pajama party” in Hollywood. Ultimately, it wasn’t his sexuality that put his career on the skids, but a change in culture. Tab’s image just didn’t fit in with the Dennis Hopper, Jack Nicholson, Clint Eastwood anti-hero types that emerged in the late 60s and early 70s. Tab was touring the country in dinner theater productions through much of this period, trying to support his mother, who was suffering from mental illness. He had a career revival in the 70s and 80s playing in TV movies and in two outrageous parody films, both starring John Waters’ muse Divine: Polyester (1980) and Lust in the Dust (1985). The latter film was produced by his partner of thirty-five years, Allan Glaser, who was with him when he died. The book and the documentary stress the role Tab’s Catholic faith played in his post-Hollywood life. He found great comfort and community there, especially after losing his brother in Vietnam. The documentary features some interviews with Tab’s friend Mother Dolores Hart, a Benedictine nun who was once a starlet known for being Elvis Presley’s first screen kiss. This is where our departed advisor and mentor Father Michael Morris comes into the story. Tab contacted Michael a few years ago abut an article he had written for the L.A. Archdiocese Diocese newsletter. Michael was supposed to interview Tab, as part of his continuing research on stars who had played roles in films with religious themes. (Remember, Joe Hardy in Damn Yankees strikes a Faustian bargain to become a great baseball player.) I begged Michael to let me go with him to visit Tab but he sort of chuckled about it and brushed it off. I’m not sure if the interview ever happened. Whatever his show business accomplishments, Tab’s telling his story as a gay man who came through the Hollywood studio system sets him apart. Almost none of the gay and lesbian stars of this era had the chance to talk about their experiences. Rock Hudson only came out just before he died, and that was through his AIDS diagnosis. Anthony Perkins, also a victim of AIDS, never got to tell the truth about his life. There is much salacious speculation about rumored queer stars like Montgomery Clift, Cary Grant, James Dean, Barbara Stanwyck, and Katherine Hepburn, but no personal accounts. Tab may have been a B-list star with A-list looks, but he outshone all of these more famous stars by speaking with honesty and dignity about his life. “Confidential” no more. A spry 84 year-old Tab (R), with his partner of 35 years, Allan Glaser.